Why Should I install a Quantum heat pump hot water system? 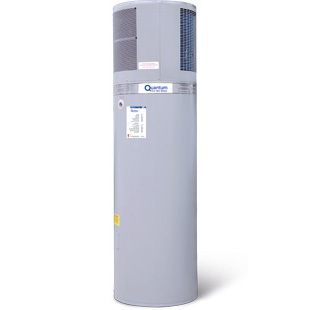 High efficiency: Quantum has been selling heat pumps for over 30 years. We have the best experience and the highest efficiency on the water heating market. Depending on which water heater is currently installed in your house, replacing it with a quantum system can save up to 75% of the current energy cost. The higher the ambient temperature, the higher the efficiency. On average the efficiency figures are 95% for gas, 100% for electric and around350% for a heat pump. Easy to install: A domestic Quantum hot water heat pump is installed the same way as an electric system. There are no panels on the roof that can incur additional installation cost or storm damage. Can operate in many different climates: Quantum heat pumps can operate in warm climates, cold climates (down to -10ºC temperature), during the day (with or without sun) and during the night. Most other heat pumps come equipped with an electric booster element that takes over when the ambient temperature drops below 10ºC. Low running costs:* The graph below shows a comparison between the cost of the different water heating systems. As you can see, the Quantum heat pump has the lowest running cost, lower than solar (and with the advantage of running without sun), and much lower than LPG and Electric.